making the system efficient to run. These hard surface floor finishes are suitable for use with both electric and hydronic underfloor heating systems. However, electric under tile heating mats are most popular in bathrooms. Warmup’s StickyMat and DCM-PRO Heated Decoupling System make a perfect option for regularly shaped bathrooms and Loose Wire is the match for irregular bathrooms with many fixtures. However, the right system, in general, is dependent on the size and shape of the area, subfloor type and the nature of your project; a renovation or a new-build. 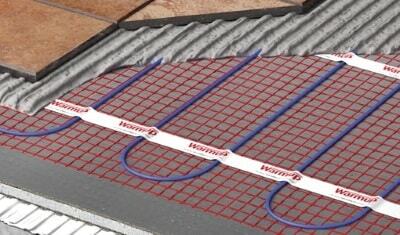 The SPM heating mat is designed for use within the adhesive layer under tiles. The fixed spacing and self-adhesive mat makes installation of regularly shaped rooms quick and easy whilst ensuring precision is maintained. DCM-PRO is a new innovative system from Warmup, proven to protect tiled floors from cracking. Consisting of an decoupling membrane with a heating cable, it makes the installation of electric floor heating quick and easy. The DWS heating cable is designed for use within the adhesive layer under tiles or within a levelling compound under other floor finishes and is ideal for installation within small or irregularly shaped areas. The WIS heating cable is designed for use in new building and can be used underneath any type of flooring, and is versatile enough to be used in any area of a residence. Tile and stone make the most functional and efficient type of flooring to use with under tile heating. Tile and stone have a high thermal conductivity which means that they transfer heat efficiently from a warm water pipe or heating cable to the floor surface. The material also retains heat well making the system efficient, because it will heat up quickly and then keep the floor warm with less energy. 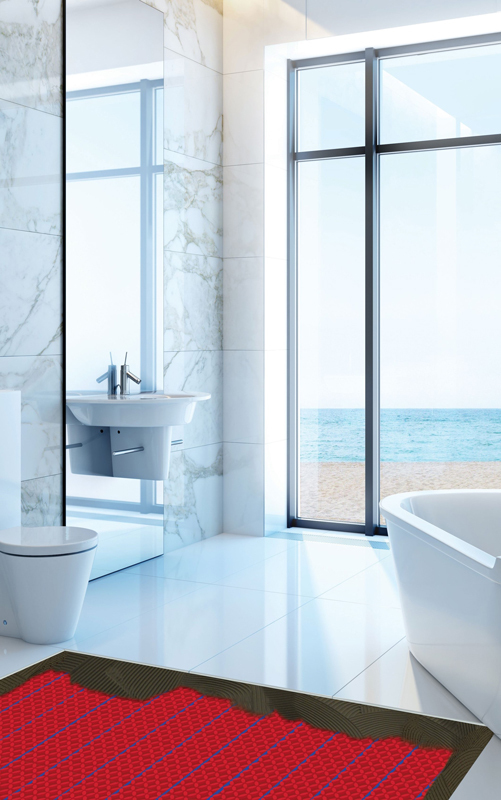 Underfloor heating under tiles or stone is especially desired in bathrooms, kitchens and high heat loss areas. Due to the excellent thermal properties they possess, they turn your floor into a heated floor quickly and energy-efficiently. They can be heated to temperatures over 29°C, providing you with optimal control and comfort of your living space. Underfloor heating takes the chill out of the tiles and controlling your heating with a thermostat means that your home is warm when you want and the heating is off when you are not at home. Tiles made from materials such as cork or rubber are normally not suitable for use with underfloor heating. 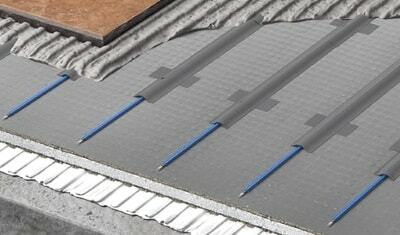 Electric underfloor heating can be installed by a DIY person or a professional installer. All electrical work, including connecting the thermostat must be completed by a certified electrician only. When installing a floor heating system with tile or stone flooring, flexible adhesive and grout should be used to allow for normal thermal movement. Heated floor tiles are worth the cost and effort of getting a system installed. The system will pay itself back in lower running costs and energy efficiency.